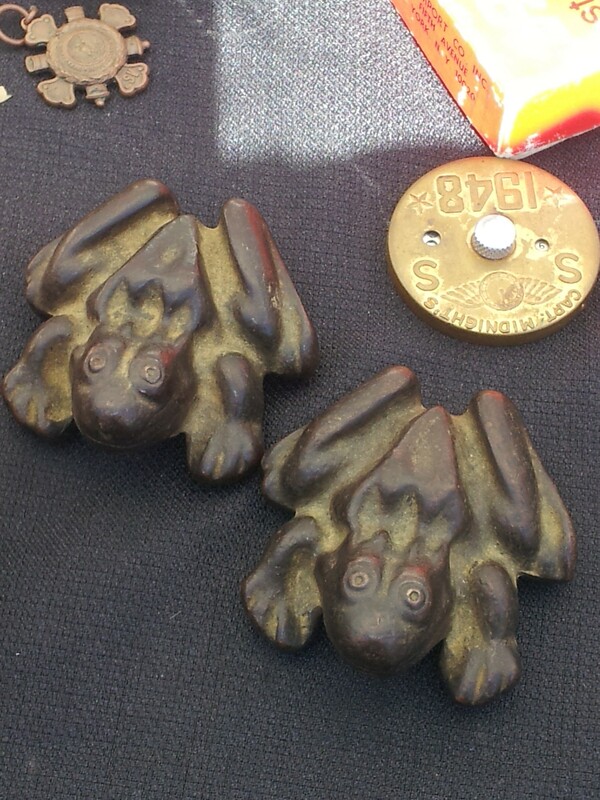 We’re back from Brimfield. While we haven’t had a chance to photograph all of our cool finds yet, we did get a chance to take some photos while we were there of some odd stuff. This post, a lot like the last one, is dedicated to the weird, the strange and the downright bizarre. Fair warning: if you don’t have a sense of humor this post may not be for you. As you may imagine, this is a photo heavy post. These were taken mostly in the last two days, Saturday and Sunday, when we had the best light. Our first pics, like the last post, are for The Bloggess. Another cousin for Beyonce. I can’t help but imagine that this bird is a little bit pointy. 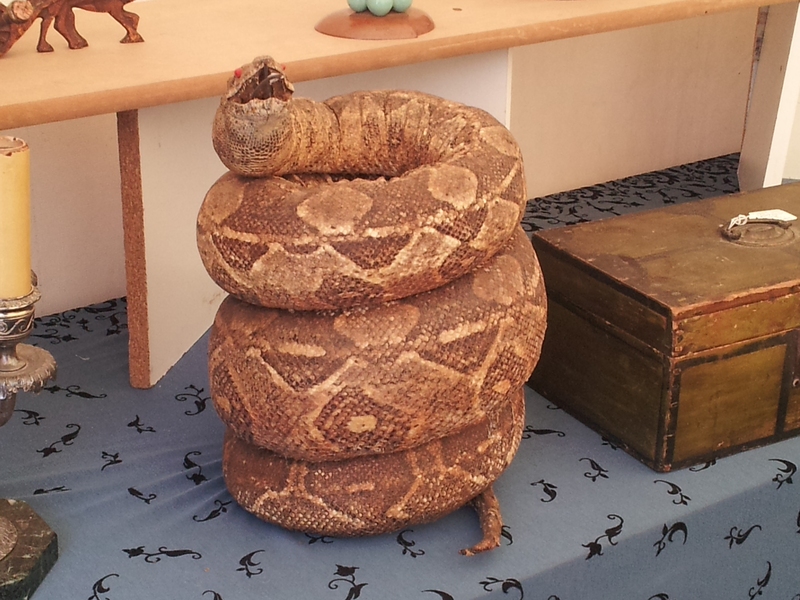 Geoff is NOT a fan of snakes. At all. Not even dead ones. Naturally, I had to take a picture of this one. 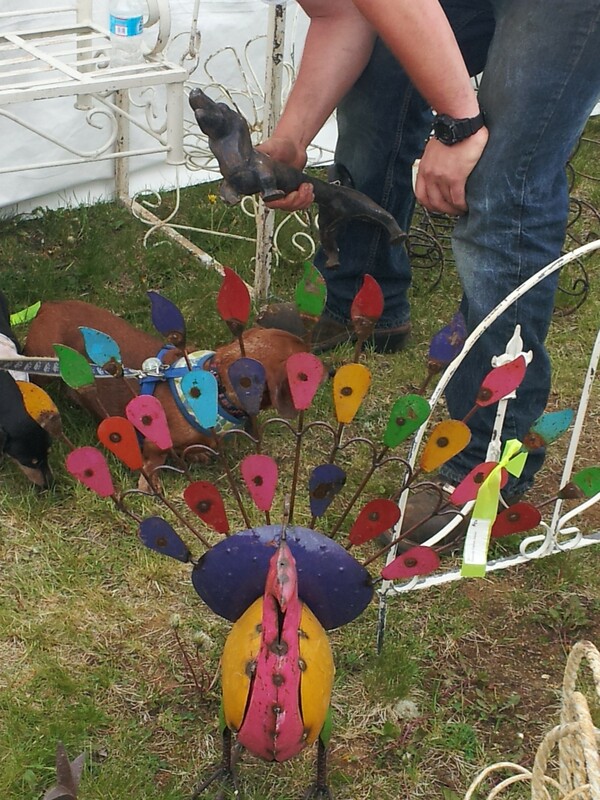 I have no idea if it was ethically taxidermied or not. I didn’t even get close enough to tell the species. You’re welcome. This is our friend Sophia. 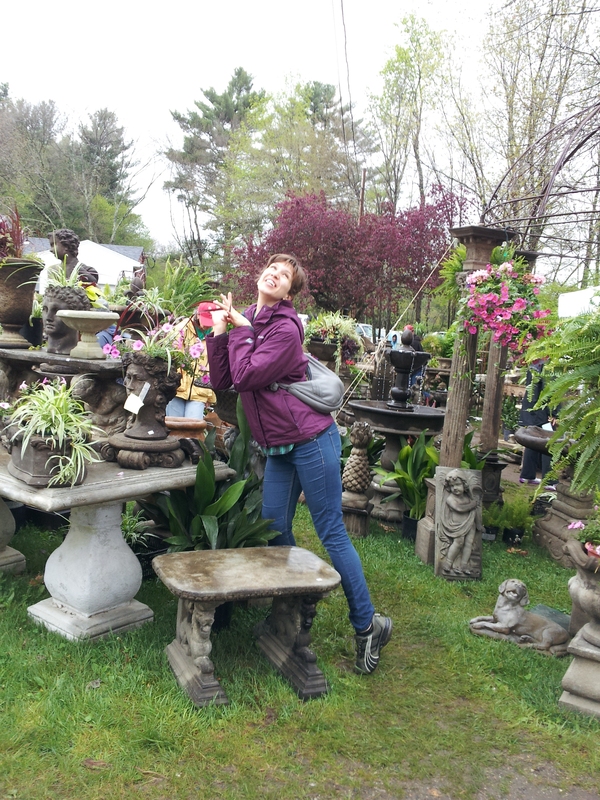 This was her first trip to Brimfield. She called it “Craig’s List come to life” and she’s right. She’s also whimsical and funny. So, first we found this. Yes, that price tag says $79.99. This is the inside. 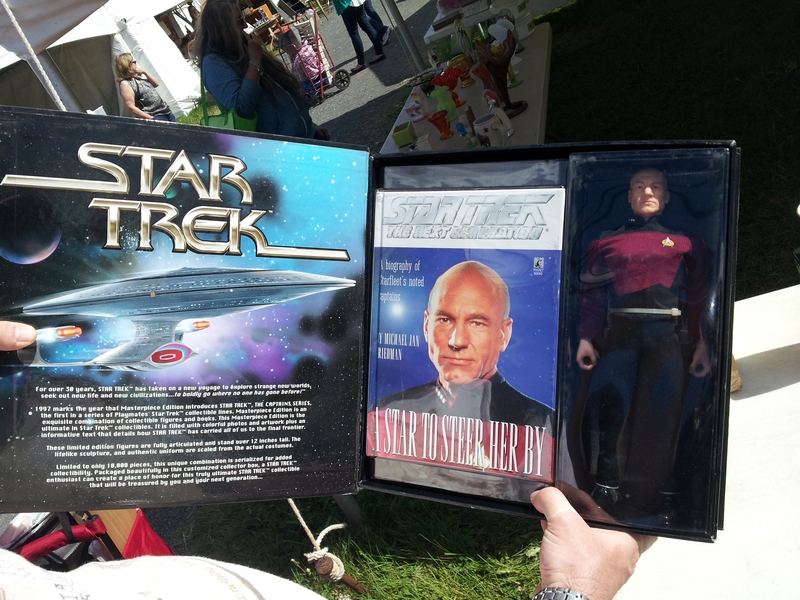 Yes, that is a Captain Picard action figure. We probably should have gotten it. 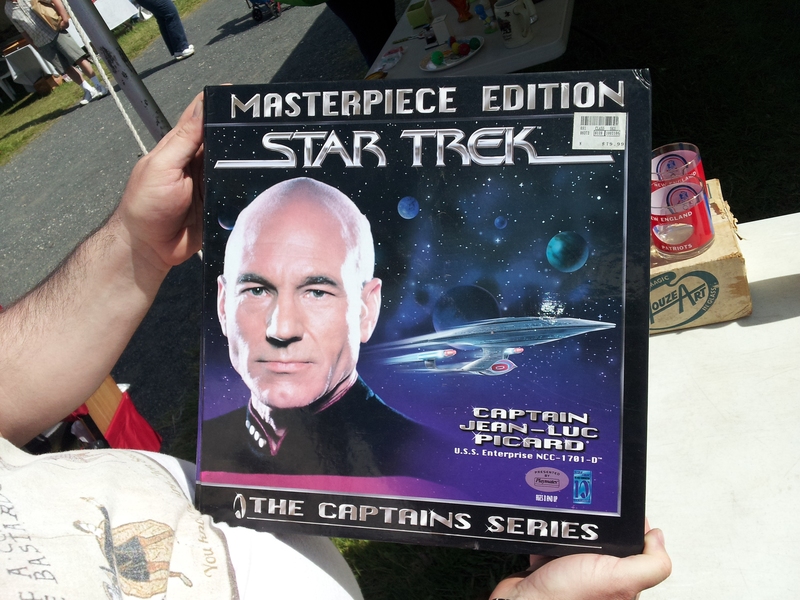 As this was our weekend to wear all of our geeky shirts, it’s no wonder that we found some other geeky stuff. 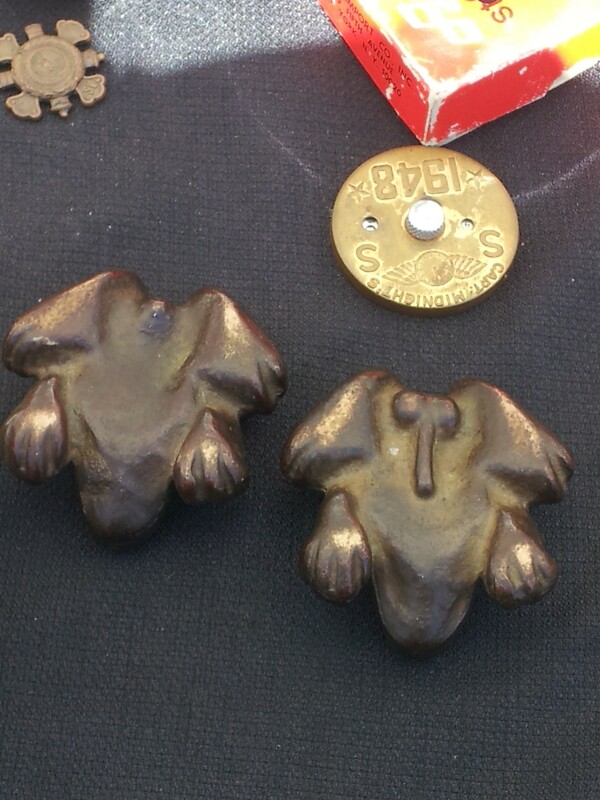 Most notably Ice’s thinner brass cousin. 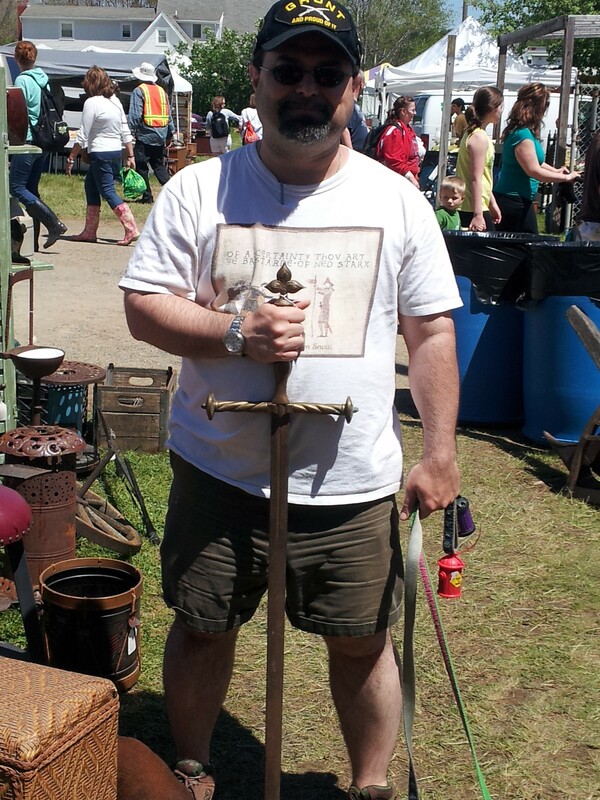 Appropriate that Geoff was wearing a Game of Thrones shirt when he found it. Ice’s thinner, brass, made in India, decidedly not full tang cousin. No, we didn’t buy it. ETA- How could I forget this??? Another GoT reference, this time one decidedly from the show. Grandma Thenn says “Want some crow, dearie?” That weird dude behind her is probably a vegetarian.. So yeah, Grandma Thenn from the TV show, not the books. And speaking of fantasy, here’s a wizard. Decidedly not Gandalf. When you can’t decide between neon and Brit-o-phile for your home, why not go with both? Good taste, that’s why. 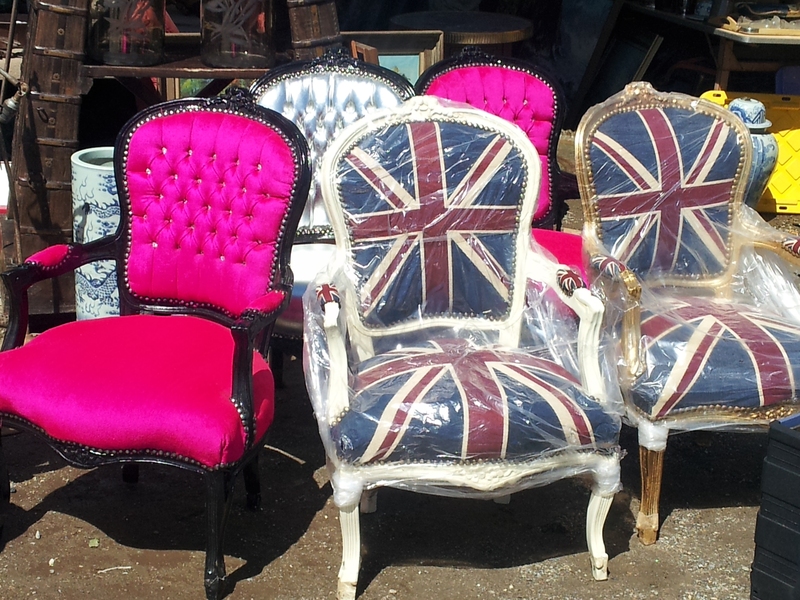 There’s something very Austin Powers about those chairs. That’s not a compliment. Then there’s this. 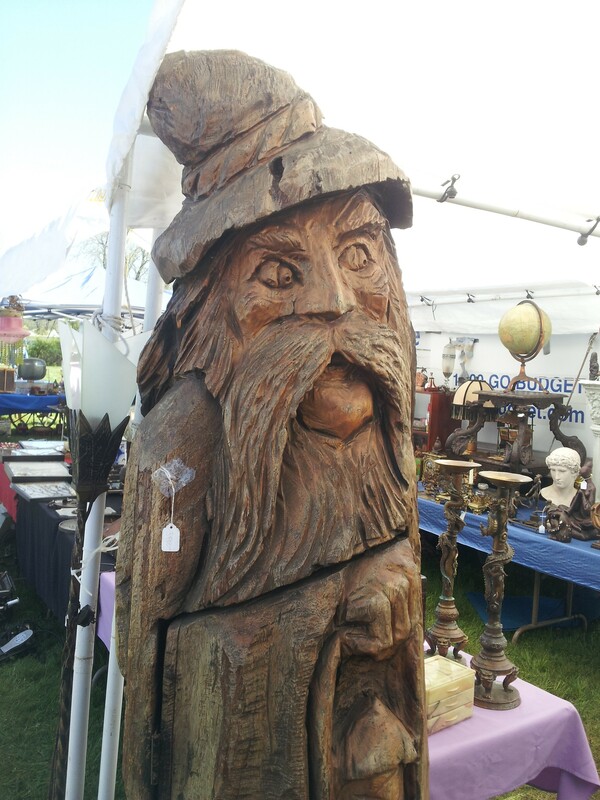 This is what happens when Brimfield vendors start to go a little stir crazy. They’ve spent too long sitting under a tent in the rain answering the same questions over and over again. They’re alternately wet, muddy, dusty, or sunburnt. They just want to sell their stuff and then go home. They get a little nutty. The chest hair just slays me. 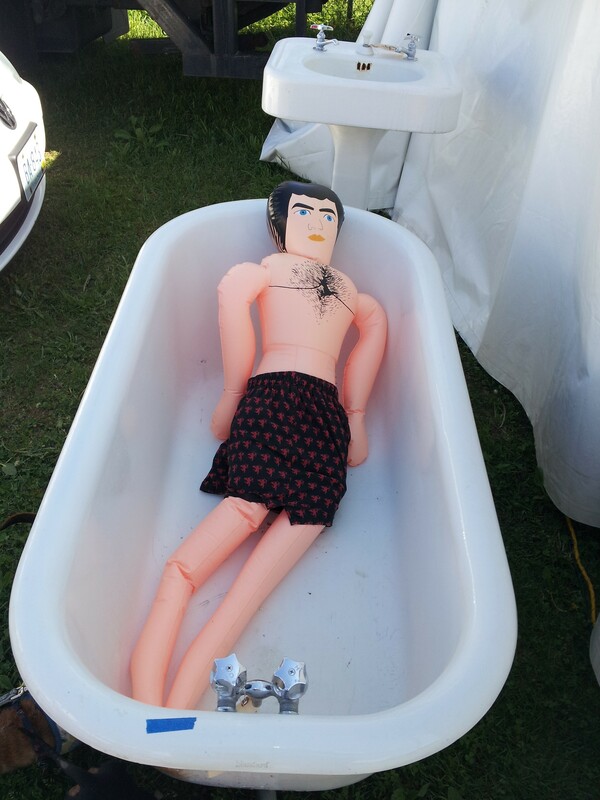 I’m not sure if the doll was for sale, the tub was for sale, or if they were a package deal. I didn’t ask. This last bit might be NSFW if your boss is uptight. You’ve been warned. I had only picked up the one on the left and looked at it. I had actually considered buying them until 1) I found out that they were $50 on the pair and 2) I flipped over the one on the right. Anatomically incorrect frog is anatomically incorrect. I feel like I should sum up with something about how it isn’t that easy to tell the difference between a girl frog and a boy frog or something but I think I’ll just leave this be. 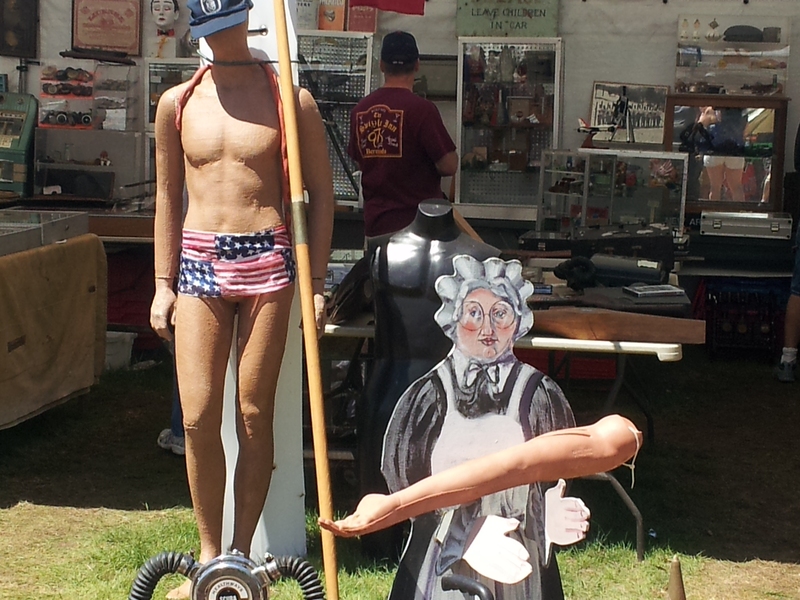 Happy Brimfield, people. Till next year.